I saw where a man fills CO2 into a bottle in his tanks every couple days. It passively diffuses into the water supplying what the plants need. It gave me the idea for this design. im not a big Co2 nut- even though I have it. But wouldn't that basically just be a horizontal reactor? appreciate the diagram it looks great. A reactor forces water into the CO2, diffusing it and reducing the flow. See shows how much I know right? Floating a bottle upside down in your tank and filling it with co2. Yeah, that's where I got the idea. Nice! if you end up making it ill be interested to see it + how it goes! The rate at which CO2 dissolves into water depends on the area of the CO2/water contact. This is a very small area. Consider that CO2 from the atmosphere has the total footprint of the tank as the contact area. This is more like drop checker! It would be interesting to find out how much CO2 gets into the water. Yeah, about the surface area. Maybe an oversized Tee, like 2inches diameter then reduce down to 1/2 inch for the hoses. 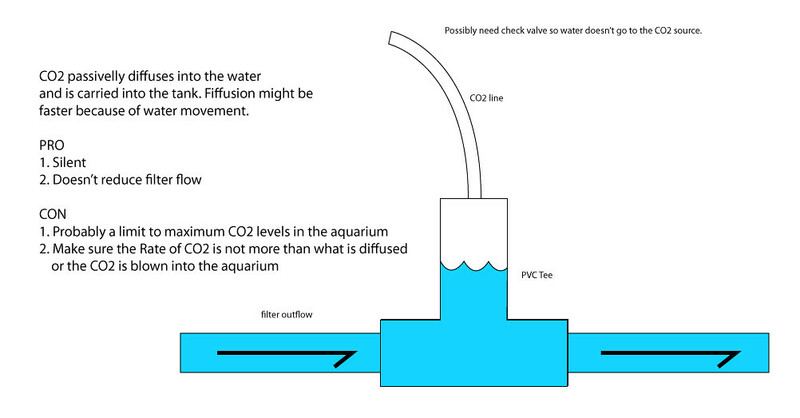 I'll have to find some transparent PVC for the vertical to see where the CO2 and water meet. A larger Tee fitting would seem to work the best. I wonder about the turbulence of the water flowing through, caused by the change in diameter, and the lack of flow through the side of the tee with CO2. I can imagine that the water in that leg would be whirling around, up and down, and let big CO2 blobs into the water flow. But, a lot of things I can imagine are nothing more than my imagination, too. I'm curious too. I want to see what's going on. Anybody know where I can get cheap 2" diameter clear plastic rigid tubing? Clear 2" PVC is quite expensive.